When people say they want to succeed or die trying, I dont think many of them mean it literally. Yet you would be shocked to learn how many people are severely affected, and yes, even killed, by the work that they love so much. Why? Because in most jobs you don’t have to worry about the quality of the air you breathe in the workplace, or toxins in the things you touch. In Makeup FX you most definately do! It is YOUR RESPONSIBILTY to educate yourself on the hazards of working with chemicals and take the proper precautions while you work. If you work for a bigger company they should provide you with PPE- Personal Protection Equipment. 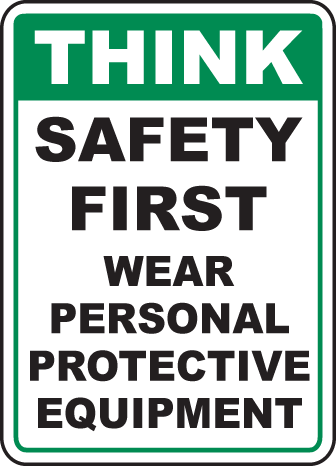 Remember: Safety gear is like Birth Control- it only works if you remember to USE IT AT ALL TIMES……. A lot of the products we use in our day to day work are hazardous in one way or another. -Some chemicals are classified as harmless, which means there is no immediate or future danger from exposure no matter what the level or amount. -Some chemicals are irritants and although they won’t make you seriously ill, they will cause annoying problems that can be hard to get rid of, like dermatitis, rashes, or mild respiratory problems. -Some chemicals are hazardous, which may mean they are tolerable in small quantities or in occasional use, but become dangerous to your health if used in large amounts or for a long time. -Some chemicals are deadly. 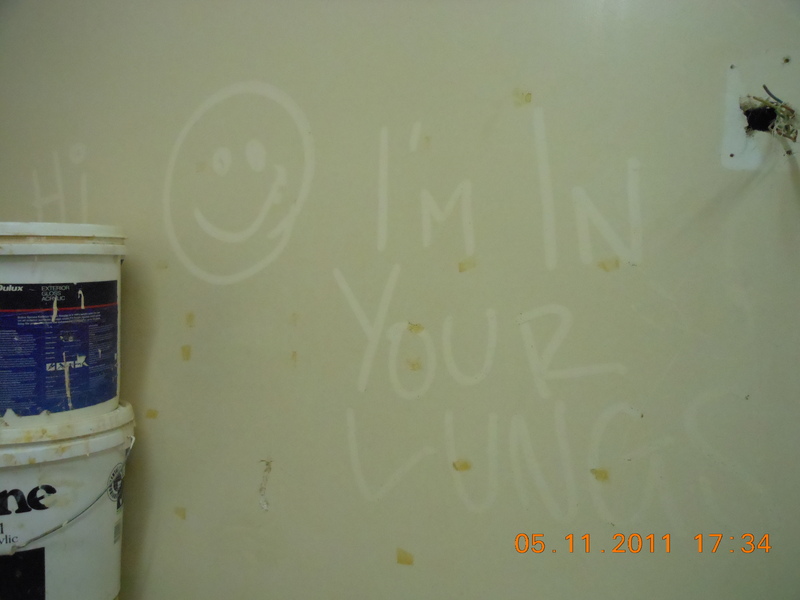 Thats the simple truth, and if you dont take care they will put you in hospital or maybe even the morgue…. People often think the word ‘chemical’ means something bad. In fact the meaning of the word is simply any substance having a specific molecular composition, obtained by or used in a chemical process. Chemistry is the study of matter and its interactions with other matter. Anything made of matter is therefore a chemical. Any liquid, solid, or gas. Your food, your water. Any pure substance or any mixture is technically made of chemicals. However, we usually use the word ‘chemical’ to refer to any substance that is a specific composition, made of one substance. Even something classified as harmless or non-toxic can be dangerous in certain circumstances. Take water, for instance. It has a health rating of zero and a contact rating of zero. But someone can be killed with it, by drowning, people have even died from drinking too much water, and boiling water or steam can be very dangerous with respect to physical contact. Therefore, under certain circumstances, water is deadly. Similar analogies are possible for pretty much everything you will ever come into contact with. Pure oxygen can cause deadly fires, and consuming an entire bottle of whiskey in one minute will cause fatal poisoning. This just goes to show that you need to treat all materials with proper understanding and respect. There are several materials that people use regularly that are potentially very hazardous, and often beginners and early career Makeup Artists simply do not realise the dangers involved in incorrect usage. Also, many people who have been using products for a long time get a bit blasé about their usage and can be unaware of the damage they have caused to their bodies by continuos exposure until it is too late. Standards of Occupational Health and Safety have improved dramatically over the past few decades, and a lot of chemicals that were once considered only irritants have now been recognised to be hazardous over long exposure. Sadly, you only have to read the papers or keep up with the news to see large numbers of people in many occupations who are suffering serious health issues or fatal diseases now, as the result of chemical exposure in their employment many decades earlier. We now recognise the health risk of exposure to materials once in widespread use in homes and workplaces, like asbestos, herbicides, pesticides and lead in paints and fuels, to name a few. In your workspace now you may have a variety of solvents, perhaps you work in fibreglass, or epoxy resins, and many will use polyurethane foams. All commonplace in our line of work, but that little list contains some of the most dangerous chemicals you can buy without a licence! When you buy any specialist materials for sculpting, mouldmaking or casting, you should receive a Technical information sheet or Product Overview, which usually consists of characteristics and specifications of the product, and includes Instructions for Use. You should also receive Safety information with it. Safety information should consist of a Material Safety Data Sheet, (MSDS) or the newer international standard of Safety Data Sheet (SDS), from the Globally Harmonized System of Classification and Labeling of Chemicals (GHS) as agreed upon by the United Nations. The MSDS or SDS is specifically aimed at classifiable chemical products used in the workplace. The Manufacturer is required by law to provide comprehensive information about the product that allows employers and workers to obtain concise, relevant and accurate information about possible hazards, uses and risk management in the work environment. If the supplier doesn’t provide it automatically, ASK! If they don’t have the information immediately to hand, then LOOK IT UP on the net. Do not rely on just any random web site; look for authoritative resources by established governmental, academic, and public service agencies. If you encounter a new chemical at your job, read the MSDS. And if you have no information about a new chemical, then it’s right to treat it with suspicion until you know otherwise. Keep your exposure as low as possible in all cases. All Chemical Products that are classified as potentially Hazardous must also be sold with adequate labelling. If the product os removed from its original container and decanted into smaller containers for sale, the new containers are also required to have any relevant warning or hazard labels on them as well. There are several different Hazard Category labelling standards and it varies from country to country, but the following standards have been adopted in many places and are easily identifiable and recognisable. There are two major scales in use. The HMIS Color Bar is used for the Hazardous Materials Identification System, (developed by the American Coatings Association). It is similar to the Fire Diamond , created by the NFPA (National Fire Protection Association, also in the USA) Before 2002 the fire diamond and the color bar both had sections colored blue, red, white, and yellow. 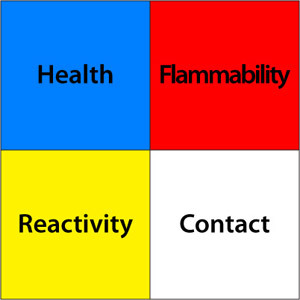 After April 2002, with the release of HMIS III, yellow in the color bar (which stood for reactivity) was replaced by orange, standing for physical hazard. The NFPA fire diamond is designed for emergencies when information about the effects of short, or acute, exposure is needed. The HMIS color bar is not for emergencies and is used to convey broader health warning information. 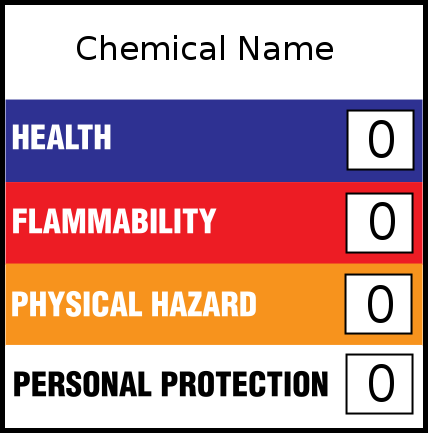 The following illustration gives an example of the kind of label used for the majority of hazard labels, based on the NFPA system. In each category square will appear a number ranging from 0 ( for low level of risk) to 4 (for high level of risk). The Health Category refers to the capability of the chemical compound to cause personal injury due to inhalation, skin contact, eye contact, or ingestion. A rating of 0 means there is little or no risk to one’s health from contact likely to occur in a laboratory environment. A rating of 1 means that the compound can cause significant irritation while a rating of 2 implies that the compound can cause temporary incapacitation or residual injury. A rating of 3 means that the compound is capable of causing serious or permanent injury. A rating of 4 means that, without taking appropriate precautions, the compound can be lethal. Materials corrosive to living tissue or toxic by skin absorption. Materials which either under normal conditions or under fire conditions give off toxic vapors lacking warning properties. Materials which on the skin could cause irritation without destruction of tissue. 0Materials which on exposure under fire conditons would offer no hazard beyond that of ordinary combustible material. The Flammability Category refers to the compounds ability to create or sustain a fire. A rating of 0 implies that the compound will not burn under normal fire conditions. Ratings of 1 are for compounds that require significant sources of heat in order to burn while a rating of 2 means that the compound only requires moderate preheating to burn. A rating of 3 is used for liquids and solids that can be ignited under most ambient temperature conditions and a rating of 4 refers to flammable gases and materials that are rapidly vaporized at normal pressures and temperatures and can burn readily. Materials which on account of their physical form or environmental conditions can form explosive mixtures with air and which are readily dispersed in air, such as dusts of combustible solids and mists of flammable or combustible liquid droplets. Materials which ignite spontaneously when exposed to air. Solids and semisolids which readily give off flammable vapors. This degree includes most ordinary combustible materials. 0Materials that will not burn. This degree should include any material which will not burn in air when exposed to a temperature of 1500°F (815.5°C) for a period of 5 minutes. The Reactivity Category refers to how reactive the compound is under normal laboratory conditions. Compounds that are likely to explode or react violently with air, water, or other common substances would be given a rating of 4 while extremely inert substances would be given a rating of 0. 4 Materials which in themselves are readily capable of detonation or of explosive decomposition or explosive reaction at normal temperatures and pressures. This degree should include materials which are sensitive to mechanical or localized thermal shock at normal temperatures and pressures. 3 Materials which in themselves are capable of detonation or of explosive reaction but which require a strong initiating source or which must be heated under confinement before initiation. This degree should include materials which are sensitive to thermal or mechanical shock at elevated temperatures and pressures or which react explosively with water without requiring heat or confinement. 2 Materials which in themselves are normally unstable and readily undergo violent chemical change but do not detonate. This degree should include materials which can undergo chemical change with rapid release of energy at normal temperatures and pressures or which can undergo violent chemical change at elevated temperatures and pressures. It should also include those materials which may react violently with water or which may form potentially explosive mixtures with water. 1 Materials which in themselves are normally stable, but which can become unstable at elevated temperatures and pressures or which may react with wtaer with some release of energy but not violently. 0 Materials which in themselves are normally stable, even under fire exposure conditions, and which are not reactive with water. This is by far the largest area of difference between the NFPA and HMIS systems. 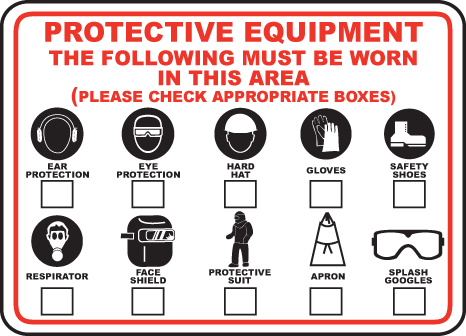 In the NFPA system, the white area is used to convey special hazards whereas HMIS uses the white section to indicate what personal protective equipment (PPE) should be used when working with the material. OX This denotes an oxidizer, a chemical which can greatly increase the rate of combustion/fire. SA This denotes gases which are simple asphyxiants. The only gases for which this symbol is permitted are nitrogen, helium, neon, argon, krypton, and xenon.. The use of this hazard symbol is optional. Unusual reactivity with water. This indicates a potential hazard using water to fight a fire involving this material. When a compound is both water-reactive and anoxidizer, the W/bar symbol should go in this quadrant and the OX warning is placed immediately below the NFPA diamond. Some organizations use other symbols, abbreviations, and words in the white Special Hazards section. COR This denotes a material that is corrosive (it could be either an acid or a base). This is a another symbol used for corrosive. The skull and crossbones is used to denote a poison or highly toxic material. The international symbol for radioactivity is used to denote radioactive hazards; radioactive materials are extremely hazardous when inhaled. 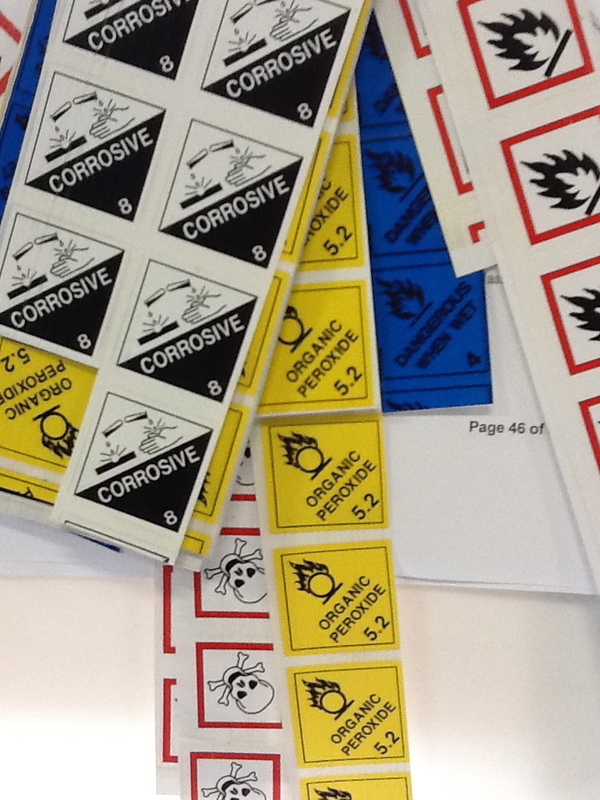 Click here for more information on classification of Dangerous Goods, with examples of Hazard labels. Safety glasses or goggles should be worn as a matter of course when using most chemicals. Eyes are sensitive. Any procedure that produces particles or dust requires a dust mask at the very least! Remember, if you can see the air you shouldn’t be breathing it! Products that produce fumes require an appropriate NIOSH Respirator with the correct rated cartridges. These must be replaced as recommended. Some chemicals require full body Tyvek or similar chemical resistant suits, along with full face respirators and a clean air supply piped to the respirator, as there are no filters available. Isocyanates found in foams are a good example of this. Gloves made out of an appropriate material must be worn. Prior to touching common items such as door knobs, the glove on the hand used to touch these surfaces must be removed. To prevent contamination, use care when putting on and removing PPE- a common accident is when someone removes one glove, then in their hurry to remove the second glove they inadvertently use their bare hand to touch the other, contaminated glove, causing potentially dangerous skin contact. WASH HANDS before eating, drinking or smoking. Do not touch your face or eyes with gloves on, or before washing hands. Care should be taken to prevent unnecessary contact of any chemical with other chemicals – potentially fatal byproducts may be produced. Deaths have occurred when people have mixed two incompatible varieties of Drain Cleaner, for example, both of which are side by side on the supermarket shelf!! Deadly gases are produced that will poison or asphyxiate. You must never mix Chlorine Bleach with any acid, or ammonia based cleaning products for the same reason. Any spills of the chemical must be carefully cleaned up. The waste must be labeled appropriately as hazardous waste and handled accordingly. Chemical storage should be careful and flammable products stored in an appropriate storage facility. As far as possible chemicals should be stored in a stable environment, with minimal temperature variation and humidity.Non-compatible wastes must be kept separate. Fires and explosions have occurred from fumes escaping and interacting with other chemical elements. Non-compatible wastes must be kept separate. Do not mix wastes.And finally, your longevity in this industry is directly related to the care and attention to detail you pay in the beginning of your career! Take care and work safe. This entry was posted on Friday, August 3rd, 2012 at 1:06 pm	and tagged with chemical safety, film makeup, learn sfx makeup, low-budget film, Make-up, Makeup Artists, Material Safety Data Sheet, MSDS, occupational health and safety, PPE, prosthetics, safety equipment, SDS, sfx, special fx and posted in Life, the universe and everything..., THE BUSINESS OF MAKEUP FX. You can follow any responses to this entry through the RSS 2.0 feed.